This is an article that was posted on our forum several years age by Jim Hatt. Jim died on October 12, 2011 of cancer. The story is just as meaningful today as it was in 2009; it tells what can happen to even the most experienced treasure hunter. Jim Hatt wrote this story so that others can learn from his many experiences exploring the Superstition Mountains and the dangers that may surprise you. Friday morning 6-26-09, Salvador Delagadillo (a friend with whom I shared the honor of being one of the Grand Marshals of the 2009 Annual Lost Dutchman Parade) and I decided to drive back into the Twin Buttes in the Gila area to take pictures of the mountain with the Heart, Horse and number 7 shown on page 18 in Bob Ward's book "Ripples of Lost Echoes". Salvador told me he had spent time there with Ernie Province back in the early 80's, and I always wanted to see it for myself but I never knew exactly where it was. Sal told me that he knew a way that we could drive right to a spot where I could take the pictures I wanted, so I just wore cowboy boots instead of hiking boots, and let Gypsy (my 120 pound Rotty) ride along since we would have air conditioning all the way and no hiking would be involved. Since we were not planning on hiking any distance from the truck, I did not think it was necessary to take the normal precautions of leaving a map of where we were going or telling anyone when we expected to return. I just told Doris that we were going 4-wheeling for the day and away we went. 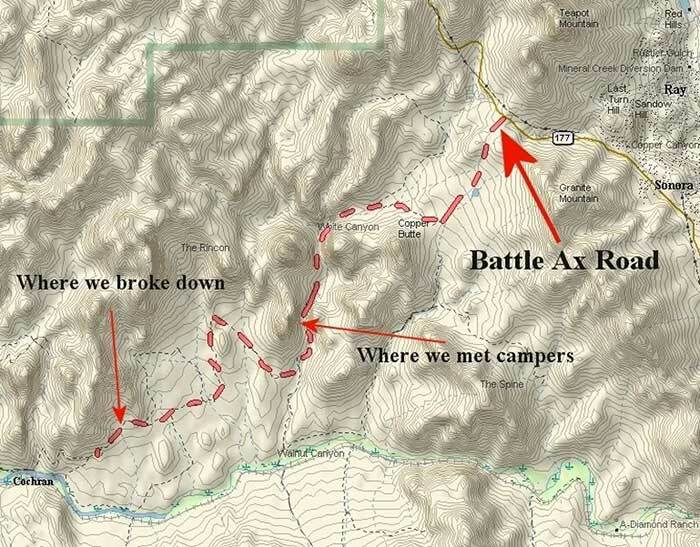 We took the old Battle Axe road South off of Hwy 177 approx. 13 miles to a point just about 100 yards before the Gila and ran into a washed out gully that I could not drive through, so I had to park there. Sal said we could walk to the area from there without any problem. We headed out on foot for what I thought was going to be a short trip, so I didn't take anything with me but my camera. About 30 minutes into the walk I started noticing that the heat from the ground was coming right through the soles of my cowboy boots and that Gypsy was showing signs of problems with the heat. I asked Sal how much farther it was, and he said no more than a mile. We stopped for a break in the shade of a Palo Verde tree and Gypsy started gagging and coughing real hard, and I knew that she could not go any farther without water. We had to abandon our plan, and head back to the river where she could cool off in the water and get a drink. On the way back, the ground was so hot that she was running from any little spot of shade to another to cool off her paws. It was all down hill to the river and we made it in about 15 mins. When we finally made it back to the truck, Sal noticed that my right front tire was flat. We replaced it with my spare and started our trip out. We only went about 1/2 mile before that spare tire went flat. It was a brand new tire that had only been on the ground twice for less than a day each time, so I had no reason not to trust it. I suspect that it may have been low on air since I hadn't checked its pressure for several years. Anyway something caused it to break loose from the rim, and the wheel cut a big hole in the sidewall. It was a little after noon and the temperature was already miserable. My cell phone had no signal so calling for help from there was out of the question. I estimated that we were about 12 1/2 miles from Hwy 177 where we might be able to hitchhike a ride into Superior where we could call someone to bring us a spare Ford tire. We had about two gallons of cold water in the truck and I thought that might be enough to make it out if it was just Sal and I, but didn't think it was enough with Gypsy along. She needs twice as much water as I do on hot days. We discussed all of our options, which weren't very many, and I finally decided to sacrifice the rim and drive on it as far as I could. I figured that every mile we could go on it was a mile we wouldn't have to walk in the triple digit temperatures. We made it almost a mile and a half before the right rear tire hit a rock with the sidewall and blew out. Now with both passenger side tires flat the Bronco was sitting very low on that side. I told Sal we would keep going as far as we could and just have to have someone bring us two tires and rims. The Bronco still moved with two flat tires but ground clearance was a problem and the bottom of the truck was dragging on the high spots and making terrible noises. We were approx. 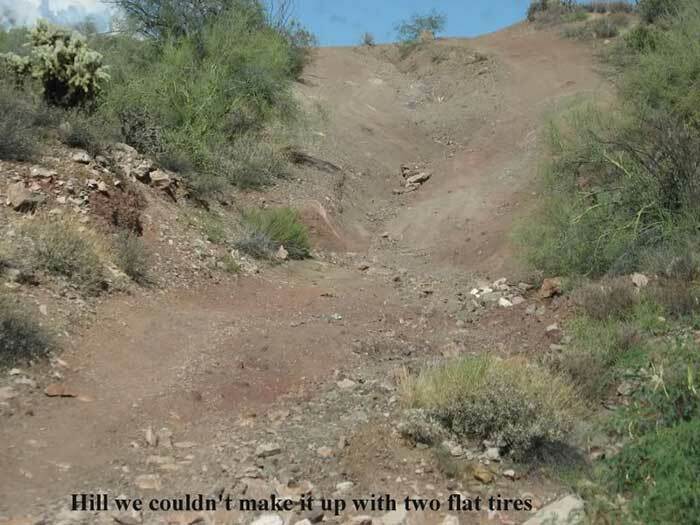 two miles north of the Gila when we came upon a steep incline with a deep crevice in the middle of it. We tried to inch our way up it dragging bottom all the way, and only managed to get the Bronco stuck about 1/4 the way up it. We piled rocks in the right places and finally managed to break free so I could back out and down to the flat area. I got a good running start and managed to make it 1/2 the way up to where we got hung up again. We sat there with the air conditioner blowing in our faces, and knew that we could work all day and never get to the top of the incline. We had the road totally blocked and I didn't want to leave it like that because if anyone else was back in there, they wouldn't be able to get out past it and would be in the same terrible condition we were in. By now I was really kicking myself for not leaving Doris a map of where we were going! She could have given that to Clay or Tom when we failed to return, and either one of them could have come to see if we were alright, or at least notified the Sheriff where to look for us. We piled some more rocks and managed to break free again and make it back down to the bottom of the incline, but there was absolutely no way to position the truck so as to allow another vehicle to get around it. We had no choice but to end up leaving it like it was. Sal wanted to get started out on foot right away and get as much of what he called a "jump start" on the trip as we could. I thought about it for a while, not in any hurry to leave the comfort of the air conditioning inside the truck, and came up with three reasons to hang right there where we were. 1 - If someone else was back in there behind us, they would need us there with the truck keys and tow chains I had in the truck to help drag the bronco out of the way so they could get out. That being the case, they could give us a ride to civilization. I figured that if there was anyone else around, they would be heading out before dark. 2 - I didn't believe we had enough water for the three of us to make it very far on foot in triple digit temperatures, but we might have enough to make the trip after the sun went down. 3 – I was considering the idea of removing the two intact tires and wheels from the driver’s side of the truck and using them to float us down the river, which I estimated to be flowing around 15 knots, all the way to the dam where there should be people and some kind of contact with the outside world. The third option would have been great for Sal and I, but the problem was, what to do with Gypsy? She does not like to be in water too deep for her to feel the bottom and goes into a high state of panic without even trying to swim. 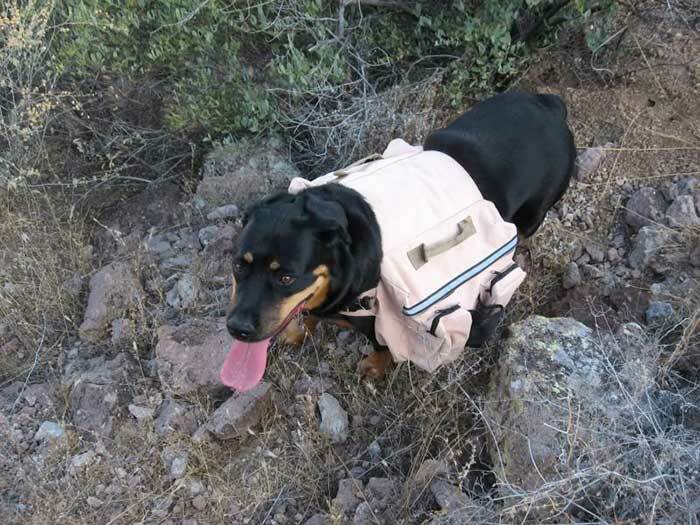 We had some empty half gallon jugs with screw on caps in the truck and I was thinking about putting one on each side of her doggie pack to act as flotation devices. It might have worked if I could have got her to relax and let them keep her afloat. But, if she panicked, she might work herself loose from the pack and cause all kinds of unexpected problems. Sal agreed with my thinking and we just sat there waiting for time to pass as we debated the pros and cons of all of our options. Fortunately I had filled the gas tank before we left AJ and we still had 3/4 a tank of gas. Several times the truck started to heat up due to not moving and getting enough air flow over the radiator and we had to shut it down for a while before we could start it up and cool off again. One time Sal went down into a nearby wash to lay in the shade, but he quickly returned to the truck when he heard it start back up. Nightfall finally came and we still hadn’t seen anyone. The idea of floating down the river no longer seemed optional due to the darkness. We only had a small sliver of a moon and some starlight, but it was enough to see the road without flashlights. It was time to make a decision and act on it at once. We loaded all the water we had into backpacks we had with us, locked up the truck and started walking. The ground was cool enough that Gypsy didn’t seem to be having any trouble walking on it even though she was packing 4 bottles of water in her doggie pack. My GPS said it was 7.5 miles to the highway (as the crow flies) and I estimated it was more like 10-11 miles following the road. We would walk for about an hour and then rest for about 30 mins. Unfortunately the farther we got from the river, the more we had to walk up hill. We kept up the same routine of walk/rest until the sun came up. My GPS showed that we were only about half way to the highway. I was amazed how fast the temperature started rising once the sun got high enough to hit us. Just when I was beginning to think that our water was not going to last more than another hour, Sal cried out that he could hear people talking somewhere ahead of us on the road. I couldn’t hear anything and fought the idea hoping that he was right. I looked at Gypsy and she was staring in the direction Sal said the voices were coming from. It appeared that she was hearing the same thing that Sal was. We were going up a steep switchback part of the road and couldn’t see very far ahead, but Sal kept insisting that he could hear voices ahead and Gypsy kept looking in that direction. We came around a corner of the mountain and sure enough, we could see a vehicle parked out on a lookout point about 200 yards ahead of us. We doubled our pace in hope of getting to them before they left. As we got closer we could see that it was a man and a women cooking breakfast over a campfire and they were not even close to being ready to leave. The woman met us about 200 feet from their campsite and invited us to have some breakfast. The man was bent over the campfire and placing eggs and sausage on two plates, which the woman took from him and handed to us. She said “I’ll have him cook up two more breakfasts for ourselves”. I shared my sausage with Gypsy but she wasn’t interested in sharing my eggs. As we were all eating, the man cooked up some more sausage just for Gypsy. We explained our situation to them and they told us that they were trying to find their way back into the Coke Ovens. We told them that they wouldn’t be able to make it all the way back there because my truck had the road blocked about 2 miles north of the river. I looked at the tires on their Jeep which were street tires, about half wore out, and told them that I didn’t think they would ever have been able to make it all the way back in there and out again on their tires. They were happy to have learned that, and started breaking their camp to head back to town. They asked us where we needed to go to get the help we needed to get our truck fixed. We told them we were from Apache Junction. They said they were too and asked where in AJ we wanted to go? We asked them if they knew where the Blue Bird Mine and Gift shop was, and they replied that they sure did, and that Louie was a friend of theirs. They stopped in and talked to Louie every time they went to Canyon Lake. They had a lot of camping equipment with them, but we managed to get their stuff and ours, all into the Jeep and still have enough room for Sal, Gypsy and myself to get in too. Once we got to Superior, my cell phone picked up a signal and I called home to let Doris (who had been expecting us home the night before) know that we were alive and well, and on our way to the Blue Bird and asked her to meet us there. Twenty years of riding around in the desert and I had never had a flat tire before this trip. Who'd a thunk it? You can bet I will never drive back in there again without having another vehicle along. Link to the origial post, with comments.